VOGAD is an acronym for Voice-Operated Gain-Adjusting Device. A device that has a substantially constant output amplitude over a wide range of input amplitudes i.e. an AGC circuit working at audio frequencies. This simple circuit was developed following the demise of the SL6270 IC although a possible alternative might be the SSM2167 from Analog Devices. The circuit below consists of an amplifier driving a variable attenuator made up of a series resistor and shunt bipolar transistor acting as a variable resistor. After the attenuator is a further amplifier stage followed by an emitter follower providing a low output impedance for the detector and following stage(s). The output is rectified by a voltage doubler and applied to another emitter follower which drives the attenuator. The higher the input level, the higher the attenuation. The circuit has a dynamic input range of about 30dB. The above circuit is designed for use with low impedance magnetic microphones with output levels in the low millivolts at normal speech loudness. The gain of the first stage is at least 30dB so make sure that your microphone does not over-drive it. As with any circuit, this is open to modification for each user's particular application. If a high input impedance is required then the first amplifier stage could be replaced with a Junction FET like the J310 although the biasing arrangements will need to change. The amplifier stages could be replaced with op-amps like the 741 or CA3140 with suitable changes to the biasing. The output has low distortion within the control range and does not require special filtering. The ideal application is to use this circuit ahead of a limiting speech processor, for example see here) with the VOGAD output set so that the limiter is 3-6dB into its limiting characteristic. 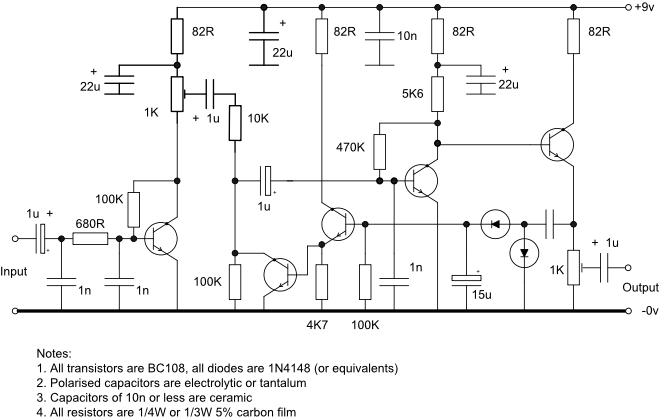 In this case check the polarity of the 1uF output capacitor above or use non-polarised type.